Check braces routinely for anything loose or bent. If a bracket or band comes loose or you break a wire, please call our office at Taunton Office Phone Number 508-824-8030 so that we can arrange an appointment to repair it. Try to explain what has happened by using the diagram provided. Be as specific as possible with our staff member. If you lose your rubber bands, call us so we can mail you some more or drop by the office and pick some up. For a brief overview of oral hygiene tips, please click on the image below. It will launch our flash educational module in a separate window that may answer some of your questions about oral hygiene. After braces are placed in the mouth it is normal for the teeth to be sore for about 2 or 3 days. Tylenol or Advil will help relieve this discomfort. Some irritation to the cheeks and tongue may occur, but if you feel anything sharp is poking you or any sores are developing, please call our office at Taunton Office Phone Number 508-824-8030. 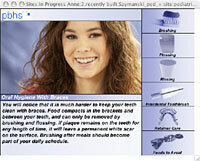 You are responsible for placing the elastics, when instructed, on your braces between appointments. Make sure to wear them as instructed. Remove them only when brushing your teeth, gums and braces after meals. Then put them back on immediately. Always carry a extra elastics with you, so if one breaks you can replace it right away. If your supply is low, call the office and we will mail you an additional supply of elastics. If your elastics are not staying in place properly, a wire or band loosens, or a hook breaks off — call our office at Taunton Office Phone Number 508-824-8030. Don’t wait until your next appointment. These problems should be corrected.